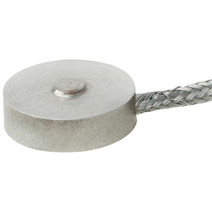 The miniature compression force transducers are specially designed for small installation spaces, and, depending on the nominal force, are only 3 mm to 7 mm high and weigh from 1 g up to 10 g (9 g up to 18 g including cable). They are used to determine the compression forces in a wide range of applications and are suitable for static and dynamic measurement tasks eg. in laboratories and test field. The spherical calotte (spherical load application button) allows a very simple force introduction. The usual mounting position of the force transducer is horizontal or vertical. The fixation is achieved, for instance, using an adhesive or using silicone. The compression force transducer is splash-proof and works reliably even under harsh operating conditions. These miniature-design force transducers with IP65 ingress protection are available with nominal loads of 0.5 N up to 5 kN. The compression force transducers are manufactured from stainless steel, and an electrical connection is available as an option. Measuring ranges from 0 ... 0.5 N to 0 ... 5,000 N are possible. The compression force transducers of the F1222 series are used, for example, in packaging machinery. One example of this is the packaging of medicines in the pharmaceutical industry. In this application, forces must be controlled and measured exactly. Numerous challenges for force measurement are to be considered, such as strict hygiene requirements, high temperatures and high throughput. The model F1222 compression force transducers meet all the relevant challenges. A further area of application is jointing and testing technology. Here, the force transducers of this series are used, for example, in the measurement of gripping forces. In order to avoid overloading, it is advantageous to connect the force transducers electrically during installation and to monitor the measured value. The compression force transducers are to be mounted on a level, grinded and suffi ciently hard surface. The force is applied vertically to the force transducer axis at the spherical calotte.